We make choices every single day. Little choices and big ones, some unconscious and others take concentrated effort. 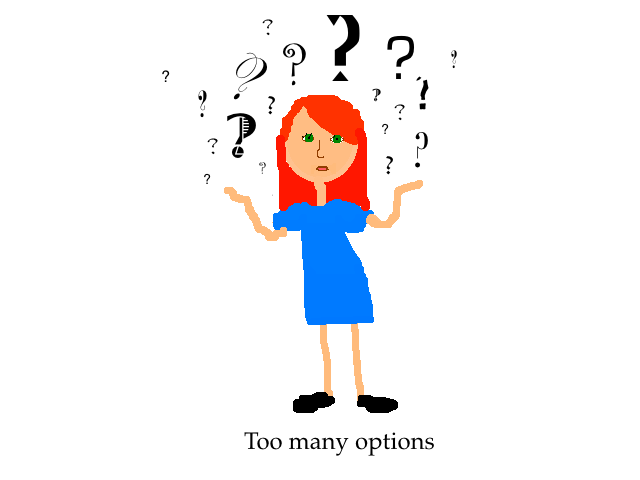 I get overwhelmed easily when faced with too many little choices. In a restaurant a multiple page menu can cause hyperventilation. At familiar restaurants I rarely open the menu and order the same thing each time. Don’t bother telling me about the specials unless you want me to faint dead away under the table. I don’t do much shopping in clothing stores for the same reason. Standing in the middle of all those clothing racks I feel as if I’m being sucked into a vortex. To make it easy on myself, I shop online and wear a lot of black. While these choices might be boring to some they are comforting to me. I relax into the known. That isn’t to say that I don’t make choices that stretch or challenge me. Choosing to share my writing is a challenge. Putting my true self out there is a choice with each piece I write. Choosing to have a positive attitude in a negative world takes concentrated effort. Choosing love over hate is the hardest and biggest choice of all. That one takes most of my effort, leaving little for menus and clothing stores. So I eat the same thing and wear a lot of black but I don’t spend each day filled with anger and focused on the negative.